It does not get any better than this. An absolutely wonderful spot to spend your summer vacation. Enjoy a private sandy beach only a stones throw away from your front door. This two bedroom cottage includes everything you need to make your vacation one to remember for years. Enjoy the warmth of the working fireplace in the evening and a sea breeze by day. A slightly sloping sandy beach provides a gentle entry to the waters edge for all ages to enjoy. The outdoor shower may be one of your favorite features. 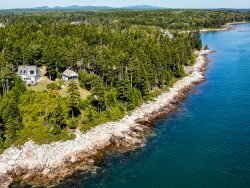 Privacy, serenity, and naturally beautiful surroundings are what make this Maine cottage truly a secret hideaway. DRIVEWAY ACCESS: There is no driveway for this cottage. If you look at the Google Earth satellite view for the cottage, you'll see the road leading to the cottage ends at the cottage just south of this one. There is parking there and a utility cart for you to use to transport your luggage and supplies across the beach from the parking area to the cottage. It is not a difficult walk but if there are people with mobility issues, it could be a challenge. BOATS INCLUDED? No, however Water Walker Sea Kayaks offers kayak rentals in the area and may be able to rent them to you at the property. Every thing was handled through the website and was quick, concise and complete. Email communications were timely and informative. The additional information on nearby attractions, dining, etc. was most appreciated. We love the keyless check-in as it gives more flexibility for arrival time. With the phone calls to the office on arrival and leaving, is also a great convenient feature. Loved the proximity to the water and the beach was wonderful. The house was cozy, beautiful and well appointed. There was nothing to want for. Loved the gulls, cormorants, ospreys (with their dinners) and especially the bald eagle that landed in a tree next door to enjoy his / her seafood dinner! Location in regards to Searsport, Belfast and Fort Knox / Penobscot Narrows Bridge - were all short drives. The drive to Acadia National Park was longer but very well worth it. OtWinME is a breeze to work with! Everything is well organized; instructions are clear; and the check in/check out procedures are simple. We love the Driftwood Cottage! The location directly on the water is our favorite part, along with the outdoor shower and the fire pit. Secluded and quiet and accommodations were completely comfortable. Very helpful and polite. A nice group of people. We thought the location and views on the river were fantastic. The house was warm and cozy and exceptionally well stocked. if we needed something, it was there. Loved staying here, a slice of heaven. If you need to get away from it all there is no better place. It was quaint, private, clean and the cottage has everything you may need. Adorably decorated in a quintessential Maine beach cottage way. On the Water in Maine has been a pleasure to work with; we have used them four times for rentals. Driftwood cottage has the perfect setting, close to the water and very private. Everyone we spoke to was incredibly helpful and took lots of time to ensure that all of our questions were answered. We loved the Driftwood cottage: it was cozy and absolutely beautiful! We loved the handy outdoor shower which enabled us to get cleaned off after spending the day at the beach before going back into the house. Everything went smoothly. On the Water in Maine is extremely organized, which is very helpful. No problems at all. We loved staying in Driftwood Cottage. The location was ideal for day trips to other locations plus the cottage itself is in a very lovely and relaxing location. Beautiful setting and view. Very peaceful. We loved the location, the private beach, it being right on the water. The fire pit, the fireplace we loved used both of them. The cottage was very lovely we loved being able to eat at the kitchen table and view the ocean, we loved just sitting in the living room viewing the ocean. The agency was a pleasure to deal with. Everyone who we spoke to really seemed to care and made us feel like a fellow human rather than a number. The property was perfect in all respects. We have rented vacation houses in much of the world for the past 30+ years and none were any better. The house is delightful and cozy. The property is absolutely incredible. Everyone I contacted - or who contacted me - was friendly, helpful and knew what they were doing. What a wonderful little piece of heaven! The location was so lovely - the view was beautiful, the aroma of beach roses surrounding the cottage was a favorite! Sitting out on the chairs, facing the water - whatever the time of day, was so relaxing! And the cottage itself could not have been better. It had the feel of staying at the home of a favorite aunt. The decor was so lovely and perfectly Maine, with an incredible attention to detail. From the coffee table in the living room (perfect hight for puzzles) to the dishes in the kitchen, along with al necessary gadgets for cooking, to throws and blankets for snuggling on the couch. Perfection again. The beds were comfortable, and towels plentiful. The outdoor fire pit was wonderful - and used every night. Not to mention the outdoor shower - a favorite. The whole package added up to a perfect vacation. Every detail provided with loving care. What a beautiful little gem. The agency was wonderful! Gave us everything we needed to know. Very pleasant when I spoke with them! My family and I enjoyed our stay at Driftwood Cottage! The kids had a great time looking for wildlife, clams, hermit crabs, snails etc.. I enjoyed the peace, tranquility, and beauty! This is my third rental through On The Water in Maine. The properties have been great and the booking experience and check in/ out experience easy. Absolutely perfect location! Gorgeous kayaking, swimming and birdwatching. The loons calling at night was incredible, and dolphins swimming during high tide was an awesome experience. As always, on the water wa awesome! Even Calls to tell us our neighbors would be having fireworks! Awesome access to the beach and ocean. Great state park around the corner. Fresh lobster very near by to purchase. Loved the wifi! House was well stocked on necessary items. Very professional. Kept in touch with emails and made things easy. Perfect cottage! Everything you could need! On the Water in Maine was professional, personable, and quick to respond to any request. This unique home was tranquil, beautifully decorated, and well appointed, beyond what was required. We absolutely adored the adirondack chairs and fire pit outside. The home was cozy, quiet, and private. Local shops were well within travel distance and with half a dozen restaurants easy to choose from. Eat in, or take out was a breeze! Having all the luxury needed as in a four star hotel. We really enjoyed having the firewood so easily accessible for those chilly nights. We were fortunate to have met the owners of this beautiful home and we're delighted with the hospitality shown to us. Thank you! This location was prime for us, as we were able to travel north and south to various points of interest. So many picture perfect mornings were enjoyed from those Adirondack chairs, sipping our coffee and taking in the majestic sunrise. If one is fortunate to stay at this location, you will find a guest sketchbook at your disposal, to share amongst the travelers before them. Take the time and review their perspective, you will enjoy! Respectfully, Sean & Kelly Z. Working with On the Water in Maine was a breeze. From the packet of information sent in the mail, all of the email contact before the trip to provide driving, and access instructions was just terrific. We had a breaker "pop" during our stay and the refrigerator went off, a quick phone call to the emergency number with a prompt call back was all it took to help us find the electrical breaker box and quickly flip the power back on. The whole problem resolved in less than 10 minutes. The cottage was very well appointed, and every time we looked we found just what we needed in the kitchen. Our favorite thing was having a fire in the firepit every night and the chairs and umbrellas out front. We felt so relaxed at the cottage, a home away from home. Very easy to deal with, did exactly what they said they would. All amenities available in house. Very comfortable and relaxing. On the Water was very easy to deal with and had no issues at all. Everything was as advertised and even then some. Seemed like we had very personal service at what I'm sure is a very busy season. The Driftwood Cottage was so cute and cozy and could not be at a better location. We had a great time watching loons and ducks from our own beach and loved the all of the parks nearby. Lots of biking, hiking, exploring and even swimming and clam digging at low tide. Wish we were still in Maine! Blueberries were probably my son's favorite! Seeing a Moose on our way to Acadia was awesome and the park's hiking trails were incredible. Wish we could have seen more but our cottage was in such a great location with so much to see and so relaxing to just hang out and eat lobsters! Another favorite! Yum! Please do not park or drive on the beach and adhere to the driving and access directions sent 21 days prior to check-in. The water is tidal and can come up rather close to the property line so for your safety, please park at the designated spot. The beach/cottage is located on Sandy Point but the beach, as seen in pictures, is rather pebbly and a true northern Maine beach. Amenities offered through On the Water in Maine Inc. are not available at all the properties we offer for rent. Boat Rentals through Maine Watercraft Rentals Inc. are offered Sunday morning to Friday after 4pm and include free delivery to the property. Check with an agent to find out what boats are available to rent at this property, or, when you process the booking here online, only the boats available for the property will be listed as available to rent. Please see our Rental Guidelines Page for further questions regarding how to book this property and additional charges and fees. Contact a reservation agent for more details or to ensure you are booking the right property for you.